Two months after recording his monster hit The Sidewinder, Morgan entered Englewood Cliffs to record probably his last “serious” album, and I claim controversially his finest. 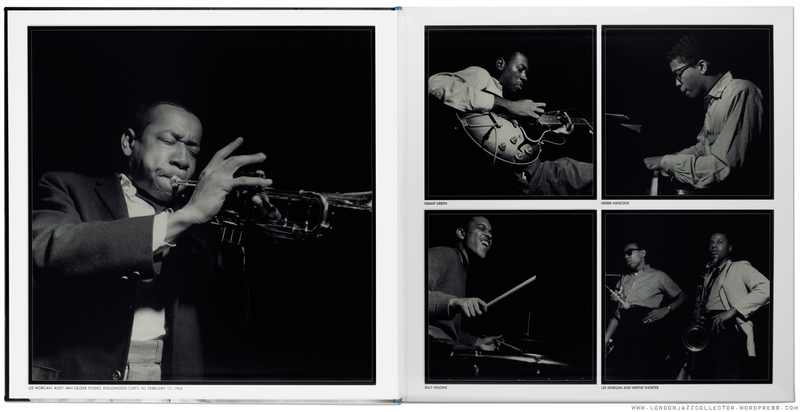 Morgan is at his inventive best, eight years into his recording career with Blue Note. Shorter, Hancock and Grant Green each turn in a sublime performance, while Workman and Higgins are rock solid. The title track stretches out ambitiously over two-thirds of the first side, opening with a dark funereal theme which unwinds slowly, giving way to a modal platform for each musician to explore the potential free from changes. Shorter is particularly Coltranish, similar structure but in fewer notes. 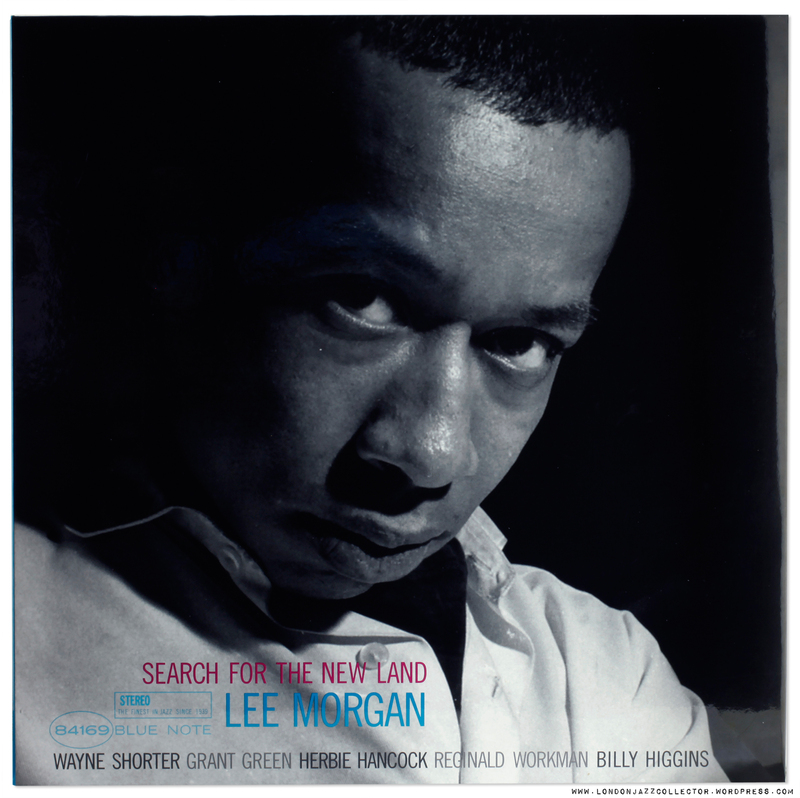 This is Lee Morgan’s maiden voyage: embarking on a journey to imagined destinations shrouded in mystery, the promise of New Land, the search for elsewhere, a state of mind, an escape from the constraints of Old Land, and old musical boundaries. For the rest of the album, moods vary from track to track, with the minor-keyed melancholy of “Melancholee“, the outrageously pacy Mr Kenyatta, and a look backwards to mainstream bebop in The Pirate. Those in search of Tendancy Boogaloo will need to follow Morgan’s other post-Sidewinder recordings The Rumproller. To pick out a few of the other highlights from The Search. Melancholee is among everyone’s favourite songs. Morgan’s bright, energetic cascade of notes with resting points of poignant sustain, vibrato and delicious timbre. Hancock maintains a ghostly ethereal presence, a flow of implied melodies that evaporate into fragments of harmony, picking at the keys. Shorter bursts in with his big, pungent tone, lower register flourishes and shrieks in the upper reaches, while Grant Green picks and fills, until the theme brings everyone back to earth. In complete contrast, a cooking rhythmic modal groove, Mr Kenyatta (selection – hat tip I guess to Jomo Kenyatta, first prime minister of Kenya, 1963). Hancock lays down a killer piano riff, interwoven with Billy Higgin’s merciless propulsion. Morgan really swings, Hancock’s hands are all over the keyboard, dancing rhythmic attack, percussive accents. Shorter really gets the groove, grinding cyclical phrases and strangled cries, while Grant Green weaves characteristically linear patterns over the frets, darting here and there. Great! This is a must have album, no question. Don’t waste time reading my scribblings, if you’ve got the record, and you haven’t played it a while, get it on your turntable and get reacquainted! MM have done their usual superb transfer from original Blue Note tapes, information-rich detail in the instrument presentation, cohesive balanced soundstage, and bless them, super silent vinyl. The bass is taut and musical compared with my Liberty copy, where it is a little puffy and soft in comparison. On the MM33, Higgins drum-strikes reverberate more naturally and convincingly, and Mr Kenyatta‘s groove has more propulsion as a result. My Liberty/NY benchmark takes a little bit of a battering this time around. Characteristically, the brass is brighter, and a little more harsh than on the MM33. Shorter and Morgan’s instruments have less body, while on the MM33 their solo’s make more sense. The overall presentation of the Liberty/NY is a little more muddy, though not to the degree of a major fault. Having said that, I was always very happy listening to it. Another set of beautiful Francis Wolff studio portraits, perfect light and shade, from inky darkest shadows to bright highlights still retaining detail. MM, you are spoiling us, this is too good. Collector’s Corner: what’s the vinyl alternative? 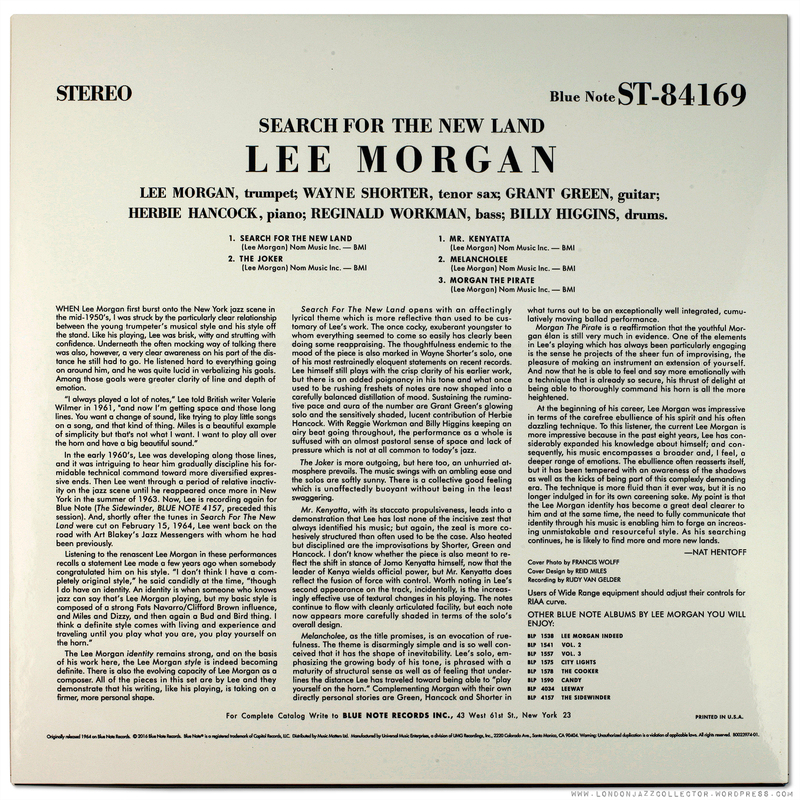 Despite being recorded in 1964, with catalogue number BLP 4169 allocated at the time, the commercial release of In Search Of The New Land was deferred for two years while priority was given to other Morgan recordings, hoping to repeat the commercial success of The Sidewinder: The Rumproller, and later recordings The Gigolo and Cornbread. Search for the New Land was finally issued early in1966, and according to Billboard, ” achieved highly respectable sales, reaching the Top 20 of the R&B album charts“. 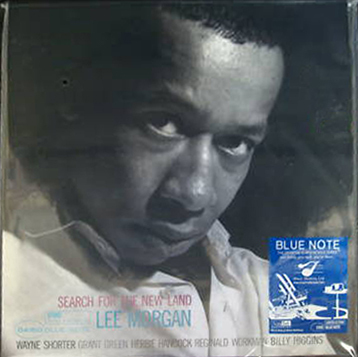 The 1966 original Blue Note issue was released in both mono and stereo, on NY labels, with the Plastylite ear, and was despatched in the then current final Blue Note corporate inner sleeve “27 Years Of”. I haven’t heard the original release either, but I can tell simply by looking at it that it will sound better, because it’s available in mono and it’s got the ear! Two of the ten highest valued auction was a sealed copy. The MM33 arrives sealed too – I thought I’d throw that in, a like for like comparison, only fair. Marketplace confusion arises because, soon after its acquisition of Blue Note, Liberty went on to press more copies of both mono and stereo editions of Search For The New Land, without the Plastylite ear, but using up old stock Blue Note NY labels. Liberty also acquired the stock of Blue Note’s last corporate inner sleeve, “27 Years Blue Note”, which can appear with these early Liberty/NY issues. The tell-tale is whether mention is made of the absence of the ear, or simply overlooked and not mentioned. With the stereo edition, Liberty went on to press more copies using their subsequent Division of Liberty labels, seen above, however pressed with the same original Van Gelder stereo master metal. Made me smile. LJC Blue Note (posted October 28, 2011) my copy and review, a Liberty/NY pressing, Van Gelder, stereo. To be fair (to me), it was written over five years ago, when I was still in short trousers, the hi-fi was still pretty primitive, and the original rip was made on one of those things you can now buy in Lidl for around fifty quid. This is my only copy of Search For. It stood up well against the MM33, but ultimately, was beaten to the finish line. Damn. It’s that open mind again. There are a few more editions around, but of these three, I am rather fond of the Blue Label United Artists editions, dating from the early to mid -70s. Everything is pre-digital, and United Artists often had access to original Van Gelder -, and can sound absolutely fabulous, though not always. Direct Metal mastering is best avoided, Capitol punishment, and the 75th Anniversary edition has reportedly been troubled with manufacturing defects, no personal experience. No, haven’t heard these either, but my preference overall is for 1st era Liberty/Toshiba (LNJ series, which I didn’t see anywhere) then King Records, then Toshiba-EMI 2nd era, avoiding anything from Toshiba manufactured after the mid ’90s. Before their excursion into MM33 territory, Music Matters previously released a 2x45rpm edition of In Search Of The New Land (2009) with transfers and mastering by Kevin Gray and Steve Hoffman at AcousTech Mastering. I have not heard this edition, so I should keep my trap shut as I am not qualified by virtue of experience to comment, other than to say I have a few other MM 2x45rpms and I have not found them very satisfying compared to the MM33s or the original Blue Note. 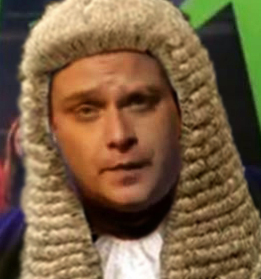 But that is for you to be the judge. Any witnesses to the merits or otherwise of any other editions of this fine recording, or any other thoughts, are welcome to take the stand. If you have a lot of spare time on your hands, say, serving a long sentence with no time off for good behaviour, there are 473 pages of comments on MMs on the Hoffman Forum to read. That should be punishment enough. This entry was posted in Blue Note, Lee Morgan, Music Matters and tagged Blue Note, Grant Green, Herbie Hancock, Lee Morgan, Music Matters 33, Wayne Shorter by LondonJazzCollector. Bookmark the permalink. Great post and one of my favourite Blue Notes. Lee Morgan did return to the search later on, check The Procrastinator twofer (1967/69 sessions) & his last studio session (titled Lee Morgan, BST 84901 double LP) for more serious work. I agree: Morgan’s finest hour. Adventurous, inventive, cliche-free. He never reached these heights again, I don’t think, and had never reached them before. I’ve always been curious about what prompted this somewhat out-of-character record. I had the chance to buy an original mono of this a few months back. The price was high, as expected, but still very good for what it was. However, the vinyl had a worrying mark on one side, and to ask to play test it through the whole mark would have been a good 10 minutes, and the store was jam packed: not good listening anyway. I wanted lots of other things, and am very happy with what I eventually bought. Still, though…. what might have been? Lovely review. An under appreciated LP. But whenever I take the (original mono) out for a spin, I skip Side 1, flip the disc over, and go straight to the final track on Side 2, “Morgan the Pirate,” which is one of the sweetest grooves in Morgan’s catalogue. One of those elegant sleights of hand that could only have been produced in the mid-1960s. Thanks for the intriguing review. As for the 45 copy, it is MONO and not stereo. This happened on others where they produced the 45 and the 33. Candy comes to mind but it is the 33 that is MONO, while the 45 is stereo. As for you comments about your 45’s, you may have heard that Steve Hoffman was only there for half the project. I’ve heard different reasons, I’ll just say that the sound is very different before and after. If you like the sound of a Linn Sondek you might like the Hoffman influence. If you prefer a more realistic sound, with the highs and lows not rolled off, you might like the later half of the catalog. The only way to tell the difference physically is to look in the deadwax where Ron Rombach’s initials can be found on the pressings without Hoffman. I also have the KIng mono pressing of Search and I like it almost as much as my second NYC pressing. Keep the knowledge and reviews coming. Spencer here still not fully recovered from the imminent arrival of Trumplandia(aka, Brexit 2.0) but if memory serves me right I do believe you have got the provenance of MM releases of Candy and Search for The New Land mixed up. On Candy, the MM 45 is a Mono not stereo. The 33 is a stereo from an extant safety tape by RVG that was virtually unused. Discovering a long forgotten pristine stereo tape MM had no choice but to put the music out and let fans judge for themselves. my understanding is that this RVG safety for Candy was created for one purpose and used once for that purpose, and that was to cut a 45 single. This MM 33 of Candy is not from Original master tape. it is from a safety made from the original master. MM has also used a safety from a master on one of their recent 33 release but I am not at “Liberty” to disclose this title. There’s a big title MM put out on 45 and 33 that was saved by safety. this release was discussed ad nauseam on Hoffman way back. RVG made safeties but not all the time. Rich, the proof is in the pudding. If you can get a hold of this MM Candy 33, your ears will bear witness to what is an exceptional stereo tape. My understanding is that most of the Ron McMaster stuff was digitally sourced. Sorry to burst anyone’s bubble. Candy review is in preparation. I can confirm Candy is a stand-out among stand-outs, I ‘ve just learned why. It takes me a little while to prepare a post, not like knocking out a 140 character tweet, but it is on the way. Stay tuned, keep watching the skies. We’ll wait for your review. 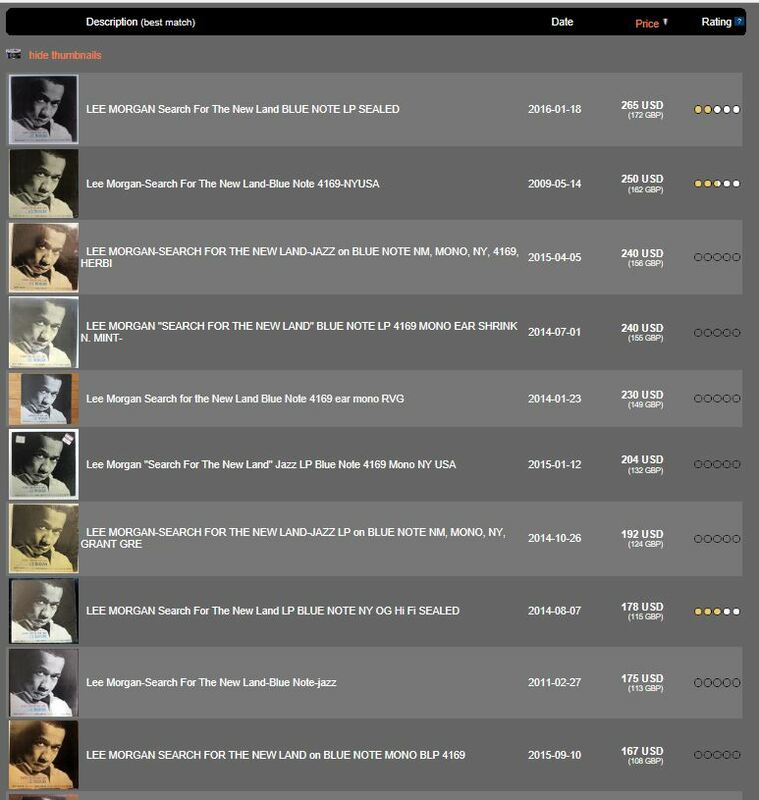 Well, I’m going to take my Mosaic Morgan boxset off the shelf and see if it has any clues about its mastering. Andy, will you cover the infamous cymbal squeak on Candy in your review? Not that I’ve ever tried to listen out for it seriously but I don’t recall noticing it. I listened again and it’s only on the title track as far as I can tell. It’s one of those noises that you could easily miss but once you have heard it, you can never ignore it again. And yes, it’s shockingly like a mouse squeak though more likely to be Art Taylor’s hi-hat in need of oiling. The Mosaic box set uses a stereo master for Candy transferred by one Jeff Rach – not a name with which I’m familiar. Thanks for commenting on the strange squeak Martin. I reviewed Candy the other week on downwithit.info and was worried that I was hearing a potentially costly problem developing in my system (or a defect in the CD that I’d ripped my streamer copy from with my Naim UnitiServe). As you say, it is only noticeable on the first track. Spencer, What is your source for stating that Ron McMaster used digital copies for his MM masters, and can you elaborate ? If you are correct this represents an egregious misrepresentation of the MM reissue program. Ron McMaster is a mastering engineer at Capitol and has nothing to do with MM reissues. Maybe you are confusing him with Ron Rambach? “My understanding is that most of the Ron McMaster stuff was digitally sourced. Sorry to burst anyone’s bubble”. This statement was made while discussing the MM reissues of LM Searching For the New Land, Candy, and other MM reissues. Hence my association of Ron McMaster with the MM program. Regarding, your reason for the difference in amount of mono pressings vs. stereo’s I would disagree. I have never heard MM or RVG say there was a sonic difference in pre- and post-mono fold downs. what I have heard MM say is that they just prefer the sound of the later stereo to the mono once RVG had a chance to get the kinks out. (and played with the location of the instruments in the room as LJC has documented) As for me, you obviously you can’t do A/B testing for identical titles, but some of my favorite monos come from the mid 60’s catalogue. You are right about the mono vs stereo MM approach. It is more about which came first. MM is not opposed to mono. In cases where there were simultaneous mono or stereo tapes they’ve gone ahead with the mono. In the case of Lee Morgan’s Candy, my understanding is that they stumbled into the stereo safety gathering dust in a non-descript pkg in the vault. After listening to what is on the tape at Kevin Gray’s studio; it became apparent that it sonic quality on par with the mono master if not better so it had to be released. The King pressing is stereo. A couple corrections: it appears that both MM reissues of this album are stereo, and as Spencer pointed out, the specs for the Candy reissues appear to be backward: the 45 is mono while the 33 is stereo. I don’t think any MM aficionados (not me) have any doubts that this is really the end of the road for the label. The Hoffman forum has covered all this obsessive speculation in great detail over the past several months. It is hard to believe that Lee Morgan was only 25 when he wrote the five compositions that feature on this mature masterwork. I struggle somewhat to really enjoy the title track, because of the format which seems a little clumsy, but I appreciate it nonetheless. It’s a great shame that MMJazz will be winding up their Blue Note project next year. As you point out, their reissues are produced to the highest standards and the gatefolds which reveal superb photographs add value. We will be wise to grab these pressings while we can because they seem destined to become highly sought after when they are no longer in print. I agree with your comments about the opening track. The flow is too often interrupted for the whole thing to properly uncoil, but Mr. Kenyatta is a terrific recording. Another great review by LJC, as always. In danger of getting lovey-dovey here! : same here, I’ve always felt the title track has a rather clumsy format. Lee Morgan on a musical high, nevertheless, on this album. LJC., you’re sending me back to the late sixties catalogue of ‘not so serious’ Lee Morgan albums. I understand what you mean. But early seventies Live At The Lighthouse sounds like some very serious stuff to me. Might as well go back there too these days. That’s the nice effect of posts like these. Great review.